Loads of herbs and lemon zest make a lighter, fresher stuffing of classic flavours, baked in a very Christmassy foil bonbon. 1. Heat the oil in a large frypan, and cook the onion, bacon and garlic until the onion is soft, about 10 minutes. 2. Cool slightly and toss with the breadcrumbs, lemon zest, cinnamon, oregano, nutmeg, walnuts, cranberries, parsley, thyme, sea salt and pepper until mixed. 3. Add the melted butter and beaten egg and mix through lightly. 4. Heat the oven to 180C. Line a large sheet of kitchen foil with baking paper. Place the stuffing on top and press into a log shape. Roll up into a cylinder, twisting the ends to seal, like a bonbon. Bake for 45 minutes, then gently unwrap, scatter with fresh parsley leaves and serve with the dry-brined turkey. 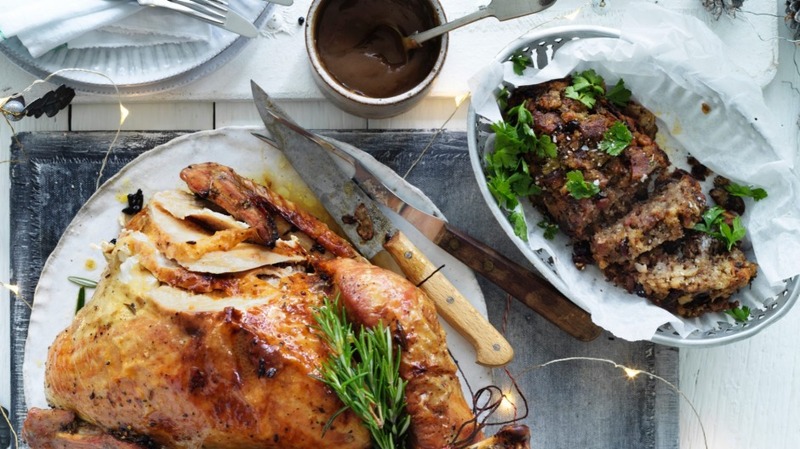 This recipe features as part of our Good Food Christmas feast.